Hospitality, location, easy conection to everywhere, comfortable beds, full set of hardware in the kitchen, everything working, ocean view. Enjoy the paradise on this chic, luxury and Elegantly 84sq meters furnished This newly renovated, first level apartment is immersed in a friendly community with only few neighbors, being the perfect place for those looking for a quiet place where is possible to relax and spend your holiday with family or friends. The ramp that connects the apartment to the beach for disabled people. Security: Watchman & Video intercom. Public transportation (Bus stop) just a few steps away from the apartment, that will take you around the island. The master suite room is situated on the most private and quiet part of the apartment with a large window facing the inner courtyard. Comfortable double bed (size: 180 x 190 cm). Closet with three doors (size: 190 of length x 240 cm high). Safe box with the password. The main bathroom is integrated into the master bedroom. Natural white stone shower (Size: 110 x 90). Weight machine in kilos and pounds. Towels for the bathroom and beach. Bed (size: 90 x 180 cm). White skin bed Sofa - chaise longue (Size: 190 x 140 cm). Small TV Samsung led 40 '100 z. 4hdmi 2usb. Scart. Wifi 24 hours. Wireless access, high speed. Cordless Phone. With free national calls. Two portable tables for the computer. Magazines & books for adults and children. With the waterfront promenade views to the majestic Las Canteras beach, the terrace with 7sq meters is the ideal place to admire the lovely sunset while having a pleasant rest. Two deck chairs (not to bring to the beach). The dining area, with capacity for 7 people, is part of the living room and connected to the terrace with amazing views to the beach. Coffee machine of a filter. I was born in Las Palmas de Gran Canaria Nowadays I live in Madrid I have three already emancipated children. Graduate in nursing and teacher of social and managerial protocol You will receive special and hospitable welcome The house is fully renovated dated August 2014 This apartment is my second house; I enjoy it only two months a year. The functioning and the quality of the domestic appliances are of high quality. We are a team of three people, the goalkeeper - Jorge_ maintaining the apartment with dedication Mary - dedicates a minimum of five hours, at each change of customer, cleaning, ordering, and leaving the apartment to taste of the most demanding client Both are persons of total confidence The apartment is decorated by my pictures, I like to cook, therefore in the kitchen I have the furniture necessary to be able to cook and invite my friends I have many hobbies: Englishman to study, to travel, to do (paint), to do yoga and pilates, hiking, to dance, to read, to travel and to meet the friends. I decided to buy this apartment for the environment and the temperature sets It is a new building, with nicely hall, few neighbors and very quiet, the apartment is placed in the best zone of the beach, very safe by day as by night, slightly windy and very silently in the night. Surrounded with everything what you need, you do not need to take car You can have dinner in the terrace and enjoy wonderful late afternoons The sea is in the calmness due to the natural bar. There is an avenue to walk of 3 kilometres and a half of length You must visit historical and cultural places and the ancient zone of The Palmas You can go shopping for the best shops of international companies only to 10 minutes walking from the apartment, You can know the musical, theatrical art and custom folkloric of the Canary Isles as well as gastronomy. Easy access in public transport. Parkings. Pedestrian walk and parks bicycles in the walk. MAIN BATHROOM The main bathroom is integrated in the master bedroom. Features: - Natural white stone shower (Size: 110 x 90). - Frameless Shower Enclosures. - Mirror cabinet with lighting. - Bidet faucet. - External ventilation. - Blow dryer 1900 w. - Weight machine in kilos and pounds. - Towels for the bathroom and beach. SECOND BEDROOM Features: - Bed (size: 90 x 180 cm). - Wide wardrobe with two doors. Washer -Siemens. Tumble dryer – Siemens. Drying rack. Clothespins Ironing board. Shopping trolley. Beach bag. Size: 30 meters. - White skin bed Sofa - chaise longue (Size: 190 x 140 cm). - Four blankets. - Black out curtain. - Soundproof doors. pots, napkins, pitchers of water, dustbin, knives, spices, apron of kitchen, soap for the dishwasher, paper(role) glad, paper(role) albal, and much more. DVD movies in several languages DVD pilates, yoga. Music DVD ever, Christmas carols, Spanish folk music, tango, waltz, rock etc. We stayed for 20 nights at this place and the most fantastic with this apartment is the area around you, close to everything and a fantastic view from the balcony watching life going by at Las Canteras. Otherwise we find the apartment average and that it needs some improvement. The sofa is quite worn down and the linen and towels as well. There is a washing machine and tumble dryer that was important for us staying a longer time, but the dryer hadn’t been cleaned for a long time, very dirty so it took us quite a time to get it in order. This happened at the weekend so we couldn´t call for Jorge that is a fantastic helpful guy. About the wifi it doesn’t work in the larger bedroom. The optical fiber just changed it for a new one and it is high speed, it works in the whole house except in the bedrooms, it is very difficult that in all rooms of the house there may be wifi, since there is no possibility of it. It does not depend on me, it depends on Movistar. The sofa-bed has been in charge for fifteen days, shortly it will arrive. The bed linen is changed every year in summer, so in June they will change again. Of course Jorge helps in all the doubts that the clients have and Mary the cleaner is very responsible with her work, she spends more time than stipulated in the cleaning, it depends on how the apartment is at the exit of the client. 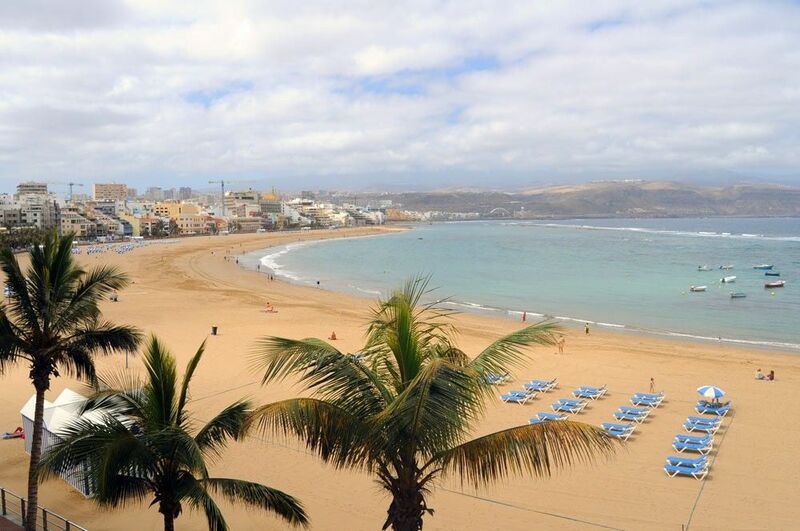 As first time visitors to Las Palmas we were looking for a comfortable flat in a good location for the beach & to be able to travel about the island. This apartment met all these requirements. It was stylish & very well equiped with a fabulous balcony providing the best view of the carnival fireworks overlooking the bay you could ask for. It was convenient for both the local & island buses. We hadn’t realised we had booked during Carnival week & the noise on Carnival main parade night was astonishingly loud making sleep almost impossible. However, the amazing fireworks right opposite the apartment the following night made up for this. The only reason this stay didn't warrant 5 stars was the lack of reliable internet which is always one of our “must haves” for a perfect stay. The apartment is in an excellent position on the sea front. It is well equipped with all the necessities, including cleaning products. The bedrooms are small but the beds are comfortable and there’s is plenty of wardrobe space and ample hangers. The concierge, Jorge is a treasure and very helpful. The owner was always on hand to answer any queries. We loved Las Canteras and had a great holiday. Thank you very much for spending your time in such a nice comment. We visited Las Canteras beach for years. The location of Cristina's appartment made this holiday experience even better. Everythings was perfect. he communication with the host was really great and helpful. Hopefully we will come back to this wonderful place. The property was well cleaned. The customer service included exactly what we needed. I recommend all this apartment. Everything was perfect, clean, great facilities, near to all. Everything you need for life. The most important thing is it very safe. The owner was very kind and very helpful about us. I would recommend because really a perfect place for families. p.s Cristina i I hope we will meet again. Aneta and his family were nice guests. I hope they enjoyed your stay at my place. Location of property was excellent, property was clean tidy and in very good order. Everything worked well and we had a really enjoyable time during our 2 week stay in Las Palmas. Would be happy to recommend this location for a visit to Gran Canaria. Landlord was really helpful and regularly contacted us before we traveled. She arranged our transfer which worked exactly as planned. All in all very pleasant experience. For us was a very pleasant experience to meet and host you. It is very well located, next to supermarkets, market, pharmacy, buses, Corte Ingles 10 minutes walk etc. This fully furnished privilege waterfront view apartment is ready for you to use. Whether you want to enjoy it with friends or just disconnect from the world, the accommodation includes all kind of utilities and facilities that will make your experience unforgettable. Including: Cutlery, china, glassware, big glasses of wine, trays, sources(fountains), tuper ware, molds of confectionary, tablecloths, frying paella pan, tables of court, kitchen utensils of all the sizes, pots, napkins, pitchers of water, dustbin, knives, spices, apron of kitchen, soap for the dishwasher, paper(role) glad, paper(role) albal, and much more. IMPORTANTE: DEL 28 DE MARZO 2108 AL 2 DE ABRIL 2108 NO TENDRE INTERNET POR LO QUE NO PUEDO CONTESTAR A LAS RESERVAS NI A LOS MENSAJES , LO HARE A LA VUELTA POLITICA DE CANCELACION DE RESERVA: No hay sanciones aplicadas si la cancelación se realiza antes de los 60 días antes de la fecha de llegada. El 50% del depósito de garantía se cobrará si la cancelación se produce dentro de los 30 días antes del check in. Se cargara elo 100% del pago de la reserva si la cancelación se produce dentro de los 15 días antes del checkin. CANCELLATION POLICY: No penalties applied if cancellation is made before 60 days from the check in date. 50% of the security deposit will be charged if the cancellation is made within 30 days and 30 days prior to check in date. 100% of advanced receipt will be charged if the cancellation is made within 15 days prior to check in date.